Install this crystal wall sconce on either side of a vanity bathroom mirror for functional glamour, or use in a hallway for a little glitter. 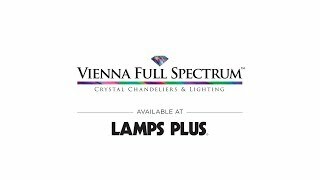 Go glam with this brilliant crystal wall sconce from Vienna Full Spectrum. A cylinder curtain of crystals wrapped around a single halogen bulb makes for a sparkling addition to your bathroom. Chrome finish hardware completes the shining style. Ideal for hallways, vanity bathrooms, and more. 10 1/4" high x 4 3/4" wide. Extends 5 1/2" from the wall. Backplate is 4 1/2" high x 4 1/2" wide. Contemporary wall sconce from the Bernadette collection by the Vienna Full Spectrum™ brand. Chrome finish frame and backplate. Clear crystals in a cylinder shape. It looks really sharp and should fit our application, a stair well. We saw it, or one like it, at The Tile Shoppe and they referred us to you. does the light shine up and down? how far does the light illuminate? how high should the center of the fixture be next to a mirror? BEST ANSWER: Generally, sconces should be 66 inches above the floor, but you can adjust this as needed to keep light from shining directly in your eyes. how are these fixtures supported? BEST ANSWER: They will include the necessary bracket to secure it to your standard electrical wall box. 4" oct. or 4"x4" square, with or with out mud ring? Hi, it is 4"x4" square. will the 4"x4" box need a mud ring or will it be mounted flush with the sheet rock? A mud ring is not needed for installation. I am sorry, we currently do not. Can you hang this on a ceiling? BEST ANSWER: Hi - this was designed to be installed on a wall. But, I do not see why not. I suppose you could. The light makes lovely reflections on whatever surface you mount it on. Hi I guess you could, but really meant for wall sconce. Can these be installed directly onto the bathroom mirror? BEST ANSWER: The lights attach to a 4" inch electrical box. If the mirror has a cutout and has an electrical box then yes. How do you replace the bulbs, how do you and what kind are they? BEST ANSWER: To change the bulb reach in from underneath the light and pull it out. Is this light bright enough for bathroom if I put one on each side of mirror? BEST ANSWER: Yes, and they are beautiful. No problem with the lighting in mirror but I do have a light in my ceiling fan also. Only use that when cleaning bathroom and shower. could I install it horizontally? BEST ANSWER: We will be installing this horizontally and, I should know tomorrow if there are any issues as the electricians will be installing it. It's so pretty but, I'm not sure how I will clean all those little crystals! Yes you could install this horizontally. yes, but it may be a bit small. Just had this installed today. I t looks great and gives off a good amount of light. I would definitely buy this again. Very happy with these sconces. Bought two for new bathroom and sparkels up the room. Perfect size (101/4 in). Beautiful lights. Good crystal for the price. Highly recommend ?? We haven't installed any of the four of them yet - not ready for that part of the redo - but can't wait to see these "shine!" I looked a long time at MANY sconces and this one was my favorite. Incorporate open modern design into a hallway with the intermingling of clear and metallic details from this charming nickel wall sconce. A detailed look for the hallway or living areathis polished nickel wall sconce features a round wall plate and conical etched opal glass shade. A cylinder of white etched opal glass diffuses the single light in this contemporary classic chrome wall sconce.